PT. Tanjung Enim Lestari Pulp and Paper (PT. TEL) operates a pulp mill in Muara Enim, which is 130 km west of Palembang, the capital of Indonesia's South Sumatra province. This is the only pulp mill in the world to produce high-quality, bleached-hardwood kraft pulp solely from plantation grown Acacia mangium trees. Using a single vessel hydraulic type continuous digester that is designed for lo-solids cooking, the pulp mill produces 500,000 tons of pulp per year, making it one of the largest mills in southeast Asia. With ISO 14001, ISO 9001, and Forest Stewardship Council - Chain of Custody (FSC-CoC) certification, PT. TEL is recognized for its diligent adherence to both quality and environmental management. The company's operation in Indonesia is world class, and it has paid special attention to minimizing the environmental impact of the pulp mill's digesting and recovery processes. The use of elemental chlorine has been completely eliminated in the bleaching process, and the mill has won the elemental chlorine free (ECF) designations. This pulp mill is very energy efficient, using only natural gas as the fuel source in the lime kiln process and black liquor and bark as fuel sources in the other processes. In 2000, Yokogawa Indonesia installed CENTUM CS, a UNIX-based production control system (PCS), to control all operations at this mill. Although this system was running smoothly, technology change had made it obsolete. To improve operational efficiency, PT. TEL decided to upgrade this system to Yokogawa's latest PCS offering, CENTUM VP. Installation by Yokogawa Indonesia was completed within a short period and the entire mill has been operating smoothly ever since. To continue meeting the strong global demand for its products, PT. 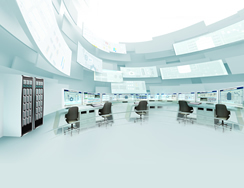 TEL needed to minimize plant shutdown time during the upgrade process. Careful attention was paid to the conversion of the I/O allocation, tag lists, regulatory controls, sequence tables, logic charts, SEBOL programs, graphics, human machine interface (HMI) displays, operation security functions, and other existing databases from CENTUM CS to CENTUM VP so as to reduce the amount of engineering work that would need to be performed during the system cutover. Consequently, execution of the factory acceptance test (FAT) and site acceptance test (SAT) went smoothly. The upgrade team made up of engineers from PT. TEL, Yokogawa, and a third party firm worked well together and completed all upgrade tasks on schedule. The process starts with the stripping of the bark off the logs that arrive at the mill. The bark is fed to a power boiler to produce steam and the logs are cut into small chips that are about ¼" x ¾" in size. In a continuous process, the chips along with cooking chemicals (white liquor) are fed into the top of the digester, while the already cooked pulp along with dissolved organics and spent chemicals exit out the bottom. The digester is a simple pressure tank, with an impregnation zone where the chips are mixed with the chemicals at a temperature of 130-135°C, and a cooking zone where the mixture is cooked for 5-7 hours at 155-160°C. Through the action of the chemicals under heat and pressure, the lignin is removed from the wood, which is consequently broken down into cellulose fibers to form a pulp. To control the digester, the CENTUM VP system calculates an important KPI, the H factor, and tracks temperature readings as well as the concentration of the cooking chemicals. Graphics showing the data from the digester are displayed in real time on consoles so that the operators can follow the entire process and make adjustments whenever needed. All the digester start-up and shut-down procedures are also configured in the system and can be safely executed by the operators at their consoles. Together with CENTUM VP, an advanced process control (APC) package is also utilized to adjust temperature and cooking time in the digester based on a Kappa number that indicates the amount of lignin remaining in the pulp mixture. By keeping this number within an allowable range, the package is able to maximize the digester's output of bleachable pulp. Via an OPC interface, a third party controller has also been integrated with the CENTUM VP system to support an APC function that optimizes chip bin level control. The pulp that exits the digester is washed and screened to remove contaminants, with the objective being the recovery of the maximum amount of spent cooking chemicals, with minimum dilution. Based on the Kappa number, the CENTUM VP system controls the amount of chemicals that are used to bleach the pulp to the desired degree of whiteness as well as the drying of the pulp to a solid content of 90%. All phases of this process are automatically controlled by CENTUM VP. After separation from the pulp, the black liquor mixture made up of dissolved wood residues and inorganic chemicals has a 16% dry solid content. Multi-effect evaporators reduce the mixture further, to a dry solid content to about 72%, which is then used as a fuel in a recovery boiler to generate steam and electricity. The remaining chemicals, now called smelt, collect at the bottom of boiler. The smelt is then dissolved to produce a "green liquor" containing mainly sodium compounds. 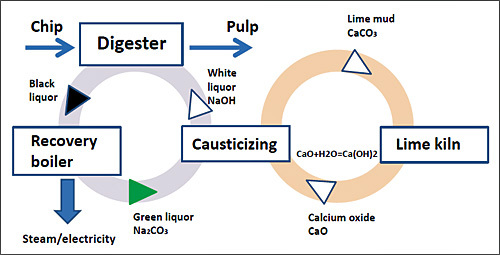 The green liquor is then sent to causticizing tanks for reaction with lime to produce white liquor, and is finally sent to a clarifier before being fed back into the digester. This is closed loop sustainable production, and CENTUM VP optimally controls every step of the process to maximize efficiency, yield, and product quality. PT. TEL is striving to improve all operations at this pulp & paper plant and make optimal usage of all the materials that go into its processes, including wood chips, steam, chemicals, and water. As all third party systems are fully connected to the CENTUM VP system with communication cards, data on the usage of all materials at this mill is clearly displayed using easy to comprehend graphics in a summary screen of the Exaquantum plant information management system. Exaquantum automatically generates daily and weekly reports that production engineers can analyze to identify areas where mill operations can be improved further. Using this system, PT. TEL's personnel can easily see the mill's total mass balance, for greater efficiency in plant operations, faster decision making, and reduces operational expenditure. Yoshihiko Katagiri, the PT. TEL General Mill Manager, said, "We are very satisfied with Yokogawa's control system and products. They have proven to be highly reliable, allowing our digester to operate at all times. We use large screens to display key operation data and the individual operators all have access to their own HMIs. 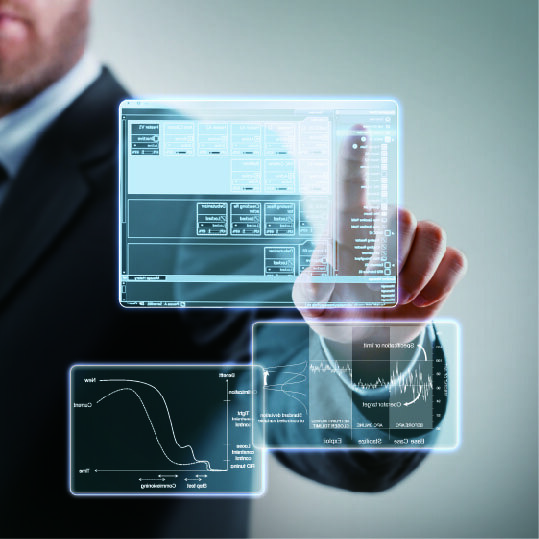 The HMI screens are all ergonomically designed, allowing operators easy access to all kinds of data. The display of this data on the HMIs is very smooth. In many different ways, CENTUM VP is very easy and comfortable for our operators to use."